Vary the sizes of how big you want these, I sized mine around 8 inches wide. Pop your card onto your mat and hit go on the Cricut, do this several times, varying the colours of your card as you go until you have 8 flowers stencils. This step is a little tricky to describe but you’ll need to roll up the flowers tightly then let them spring out and uncoil until a flower shape has formed! Glue this in place then allow to dry and repeat with your other flowers. Go back to the Cricut design space and head back to the image library again, this time open up image #M2556AC, this will be your foliage! Load your green card into the machine and cut out the leaves! I cut out around 80 of these. Next it’s time to glue the flowers and foliage to your bamboo sticks! I found this easiest by gluing a small circle of card to the bottom of the flowers then glueing the end of the bamboo sticks directly to this with two card flaps for support. To glue the foliage I just glued the leaves in various directions to the edges of the bamboo sticks until they were suitably covered then started gluing leaves to additional leaves to get a draping effect. Finally add them into your cake! 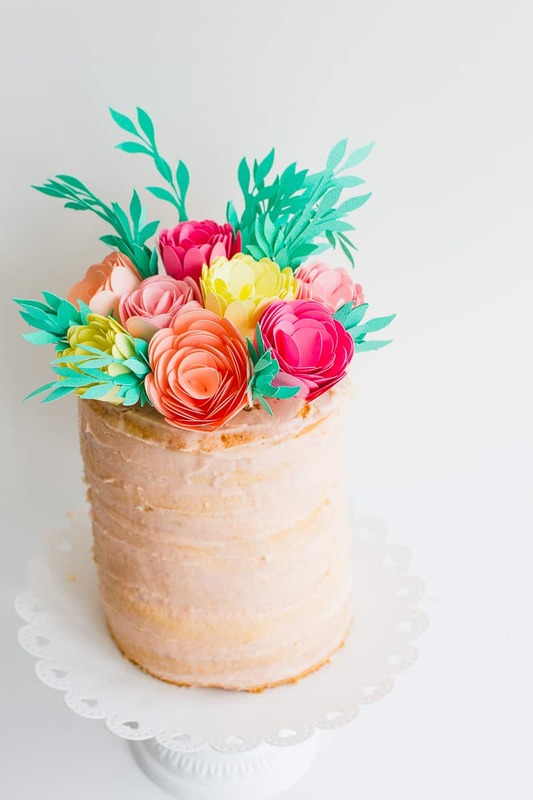 You’ll want to place the bamboo sticks in at different angles so that flowers sit flat on the cake but are facing outwards around the cake. This is awesome!!! Thank you so muh for this tutorial!